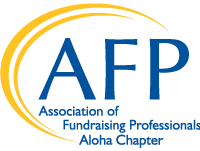 The Aloha Chapter sends out our monthly The Mentor e-newsletter to share with our AFP Aloha Chapter members and the general public any recent news, events, or job announcements. Join our email list! Like many professional membership organizations, our chapter office hours are limited and work is facilitated by member volunteers. If you do not reach us during office hours, please contact our Chapter Administrator, Susan Oshiro, at admin@afphawaii.org via email so we can efficiently address your membership or chapter need. Mahalo for your time in communicating with the Aloha Chapter office!